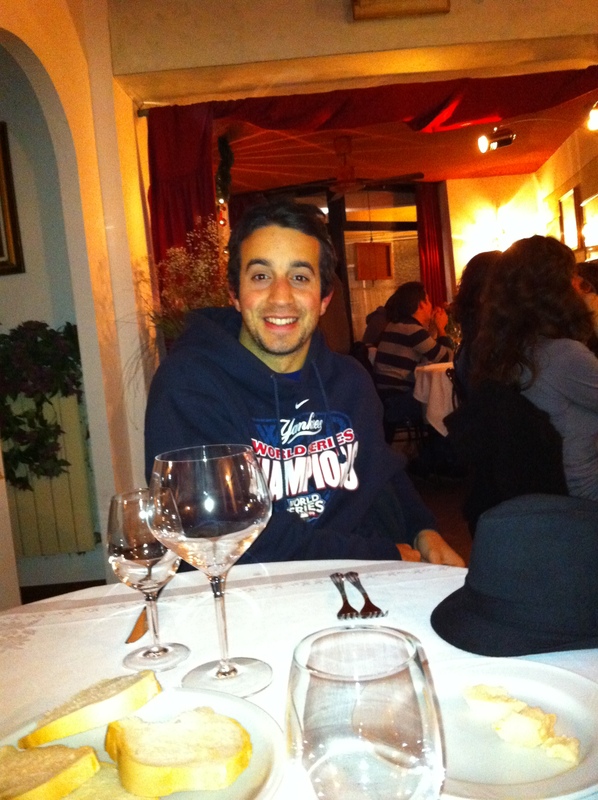 James Sasso's Blog | Your view into my Italian world! It seems fitting that I would write the concluding chapter of my travel blog while riding a train to New York. In Italy I wrote the vast majority of my journal entries, dutifully tapping away at my iPhone, while riding in the cars of European trains, sitting in airports or sitting at 30,000 feet watching the sky turn to an ocean of white cotton. What is unfortunate, and quite annoying, is that today is March 5, 2011; I left Italy on December 22, 2010. Why has it taken me so long to write this? I think I’ll begin with the most obvious of changes that Italy had on me; my social life. I no longer feel comfortable in the big party, loud music, house situations that are inherent in being a college student in America. I hate it actually. What happened to sitting outside of a bar and talking about life with your friends until its time to go to a club if you feel like it? What happened to the glasses of wine and aperitivo? What the hell are these drinking games that invite you to drink crappy beer really quickly in order to get as drunk as possible? Where did the sensibility, sociability and maturity of Italian life go? Why are my roommates blasting the music as loudly as possible, making it so I cannot talk to the person next to me, when the only people in the house are us? I cannot do it anymore. And I haven’t, and it’s put a bit of a strain on the relationship with me and many of the housemates. This was typified on the first weekend night back at BC. My house was throwing a party. I felt awkward and went next door to hang out with Courtney. Neither of us felt very enthusiastic about reentering the BC party culture, and to this date, neither of us really have. It’s not that I’ve become less social, but I certainly have been made to feel less social. My friends look at me like an alien when I tell them I have no desire to drink, or that I’m too sick to go out with them. The truth is that I don’t have an aversion to drinking, going out or socializing, it’s that I have an aversion to going out in the BC mode. What I really want, and the times I find myself happiest (socially that is), are when I go to a bar with friends, or I hang out with my friends and watch a movie; anything where we can talk. Courtney has always said drinking is about socializing. I never quite knew what she meant. ‘Of course drinking is about socializing;, I thought in my pre-Italy days. ‘You socialize by going to big parties.’ But, no you don’t. How can you socialize when you cannot talk to the person who is standing less than a foot away from you? Italy gave me a long lasting appreciation of the ability to converse. My understanding of the value of communication grew exponentially both as my Italian improved and as I began to become close enough to my friends abroad that we could have deep conversations. My fondest memories of Italy all involve discussion. Yes the food was fantastic and the sites incredible, but everything was fodder for conversation. As Brian said at our final dinner, “Dinner is not about the food, it’s about what you say to the other people at the table.” Something of which I think Americans have lost sight is the magic of communication. How many families don’t sit down to dinner together on a regular basis? How many people spend their spare time mindlessly watching a television instead of discussing the world with their friends or family? Communication is the great specialty and significance of the human race. We, more than any other species, have the ability to translate our deepest thoughts, emotions and feelings into comprehensible language, both physically and verbally. Why would I ever want to waste this incredible skill? And besides the mere act of communicating, I learned of the frustration that can occur by not having the ability to convey myself properly. Despite my decent Italian there were plenty of times, more so at the beginning than at the end, where I felt stymied by my lack of mastery of the Italian language. I often found myself wanting to delve into a philosophical discussion, political debate or life conversation but unable to do so because I literally could not find the words. And when my Italian finally became good enough to do so I felt a wave of relief and joy. Nice and I were driving to pick radicchi (oh how I miss that!) when I started to tell her how incredible of a person she is and how mystifying I found her optimism. At that moment the full use of my communicatory skills returned and once again I felt fully like a person. The frustrations of having valuable thoughts go uncommunicated and dissipate in my mind left as the words flowed out of my mouth in Italian. In reality the importance of this journal was personal because it gave me an avenue to communicate the thoughts that I might not have been able to communicate in person to the people around me. The power of the word allowed me to tell the world about my months of enjoying life. I certainly came away from Italy with the ability to recognize, more than ever, the boundless potential of the human race to create beauty. Indeed it made me have a revival of optimism about humanity’s chances to grow and improve the world. We are not a doomed race. We are not evil. We are not ignorant. Of course we can act stupidily, but the marvels that we can create, and especially the ones that I saw, made me much more appreciative of humanity as a whole. If we can paint The School of Athens or build the Blue Mosque than why could prevent us from coming together to solve the problems that infect our world? If an individual can sculpt The David why can’t an individual sway the masses of the modern world? Surrounded by greatness I imagined greatness. Surrounded by beauty I started to believe in beauty. Is there anything more valuable than being thankful for the gift of life? I celebrated the magic of living every day of my life while abroad. In everything I did, in everything I ate, in everything I saw, in everything I thought, the idea of life came back swimming into my mind. Was I really living that life? Was life actually meant to be enjoyed like this? I had always lived to live, but this was living in life. Nothing could be more real or meaningful than constantly being amazed at your life. Living should be stunning. We shouldn’t be able to sit down and say, “Yea this is normal.” Life, in itself, is too precious and too rare to throw away to normality. I’m not arguing that every day should be spent chasing a new dream or by traveling to a far distant land, but I now understand that I in everything we do, we should be able to find that magic of life. Life has nuisances and life has bumps, but life is wonderful and I can once again thank my four months of living in life for imbedding this new sense of optimism and new eyes with which I look out on the suddenly bright world. I miss it. I miss the food. I miss the art. I miss the lifestyle. 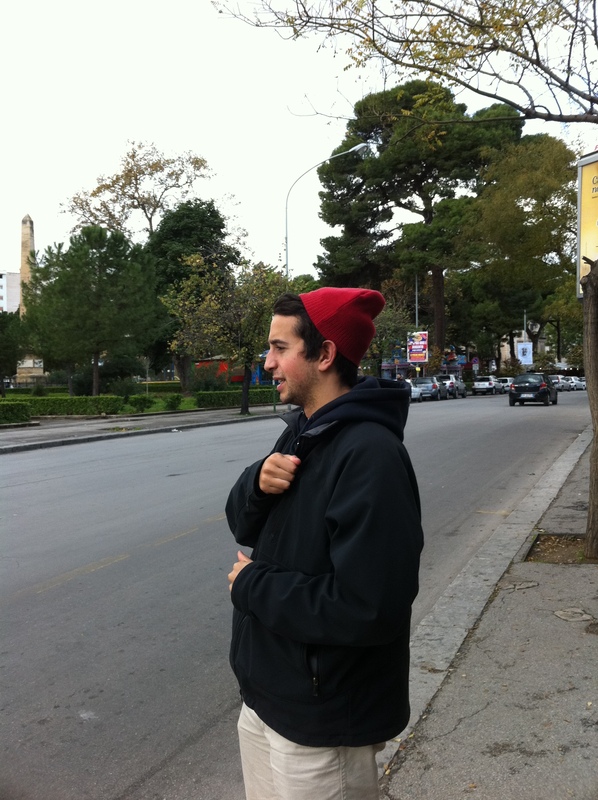 I miss the travel. I miss it terribly. That does not mean, however, that I am unhappy back in “the swing of things” at BC. This is my life and I’m loving it. I wish certain things would change, but it’s my life and it’s in my power to do something about it. It’s up to me to keep the lessons of abroad within my heart and within my actions. Life is much sweeter. My life is much more fulfilled. How could it not be after 4 months of wonder? I have left Italy, but Italy will never leave me. Courtney’s bags finally arrived around 1 in the morning, which in all honesty annoyed us because it might have been easier for them to be shipped to the States. Then again, they very well might have been lost in the process all over again! We woke up early, made it to the airport on time and I waited in line to check-in, when surprise! My flight had been cancelled from Madrid to JFK ten days ago without anybody telling me! For those of you who have seen me yell at bureaucrats, I was pissed. I had to go to the ticket counter to find out why. 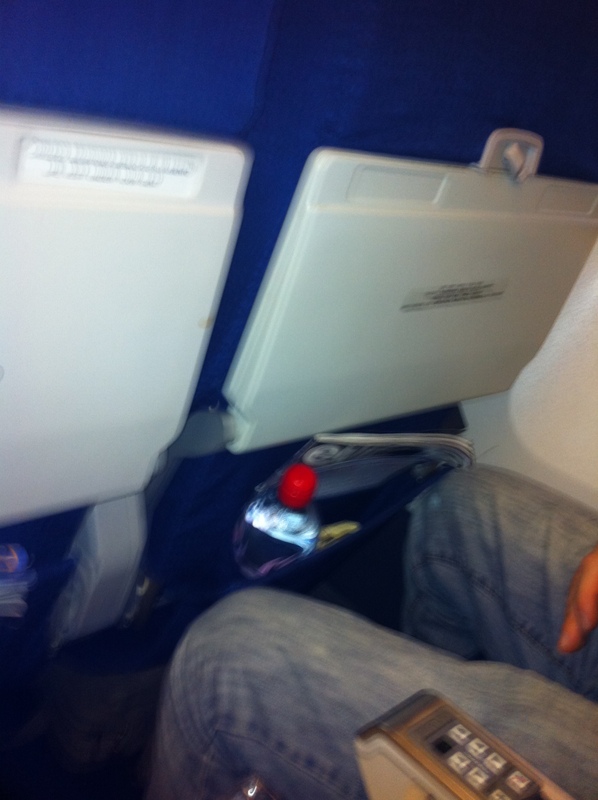 They didn’t give me a reason, but told me that Orbitz (through whom I booked my ticket) should have sent me an email. I was booked for the next day at the same time. After initially wanting to jump over the counter and strangle the man telling me that there was no flight to which I could be switched, I realized that he was a very nice man. He told me that I could still go to Madrid, but would then have to find my own way to JFK or wait until the next day for the flight onto which they had rebooked me. I called home (thanks to Courtney having a phone) and found out that there were no possible flights from Madrid to JFK. I would have to wait until the next day. I calmed down. I apologized to the man who told me that it was no problem. It wouldn’t be so bad to stay in a hotel, watching movies, reading and writing all day. At least I had the flights for the next day. It could be worse, I could have been flying through Dublin. So I spent the day in the hotel room alone, waiting to go home. 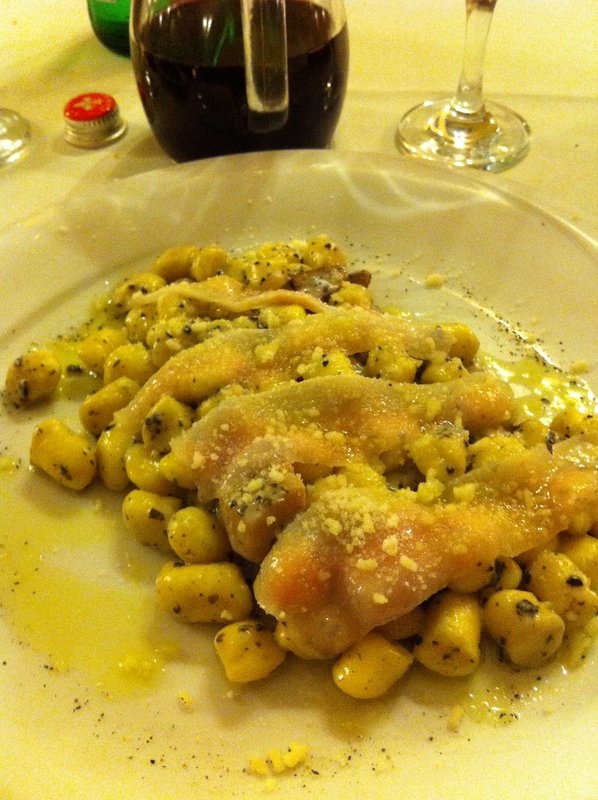 I ate what turned out to be a fabulous meal in the restaurant downstairs of fried zucchini flowers, gnochetti with truffle sauce, porcini mushrooms and lardo (can you get more intense flavors than that?) and an order of sautéed chicory. I read while I ate and for the first time really felt comfortable eating by myself in a restaurant. Courtney did not sleep well in her sickness and unfortunately could not go to the Vatican. I felt horrible leaving her at the hotel, but she wanted me to go and in all honesty she needed undisturbed sleep. It was probably better that I was off and let her sleep. I made it to the Vatican right on time where I had been three and a half years prior and, then, had waited in line for over an hour (maybe two) during the summer, even with reservations, to see the museum. This time there was absolutely no line and I entered the museum nearly undisturbed by people. I took my time walking through the numerous halls filled with Roman and Renaissance sculptures. I marveled at Etruscan goods and war gear. I tried to find my family towns in the Hall of Maps and genuinely enjoyed all of the art surrounding me. 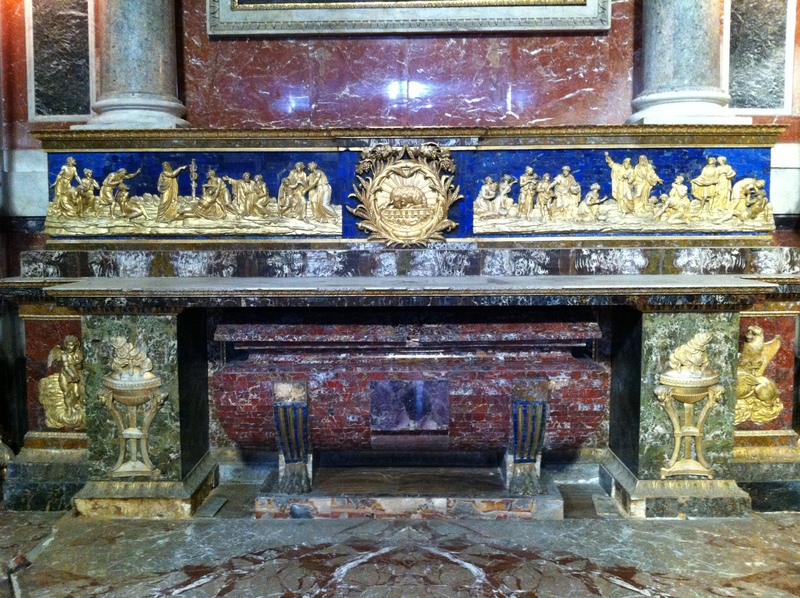 Near the end, however I came to the first of the two most famous rooms in the Vatican; the Room of Rafael. Rafael frescoed the entire room covering it with four of the most beautiful paintings in the world, including his most famous piece “The School of Athens”. My last time through the Vatican I had been rushed through by the workers who wanted to control the massive crowds swelling around the incredible piece of art. This time I had endless time to study and memorize the picture from left to right. Besides that this time I had spent several years studying philosophy at Boston College and knew much more about the figures in the painting. I had read their works and knew their philosophies and they had greatly affected my life and here they were all grouped together into one place. Without photographs and without portraits this painting gives the best representation of what these geniuses looked like. The painting, besides being aesthetically gorgeous, filled me with the intense desire to succeed. I wanted to be like these great philosophers who spent their time thinking, learning and debating. I wanted to discuss life and its intricacies. I was in the presence of some of the greatest minds in the world represented by one of the greatest artists to ever put a brush to canvas. 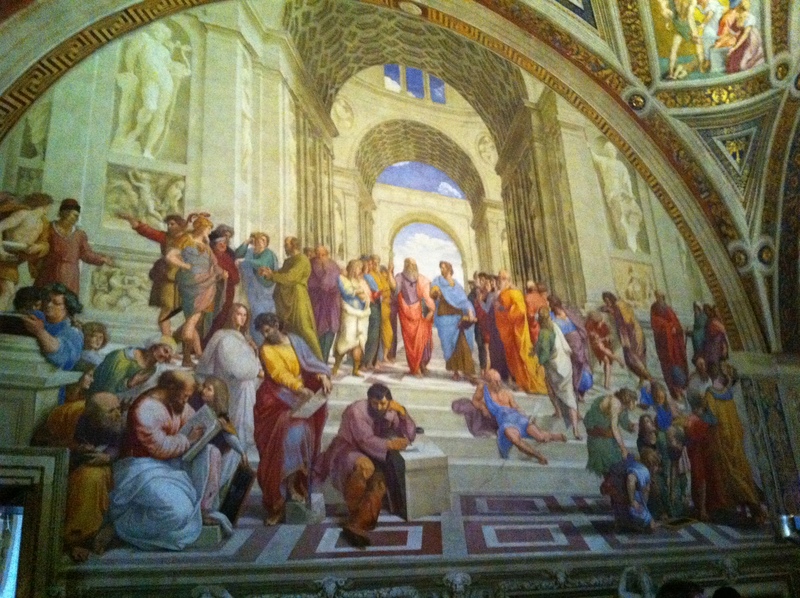 I wanted to do nothing more than write and try to prove my value amongst the School of Athens. I doubt I have ever been more moved and more inspired by a single painting in my entire life. Then I made my way to the finale of the Vatican City Museum, the Sistine Chapel. Like the Rafael room I found myself with endless time to observe fully the room instead of the limited, rushed time I had my first time there. 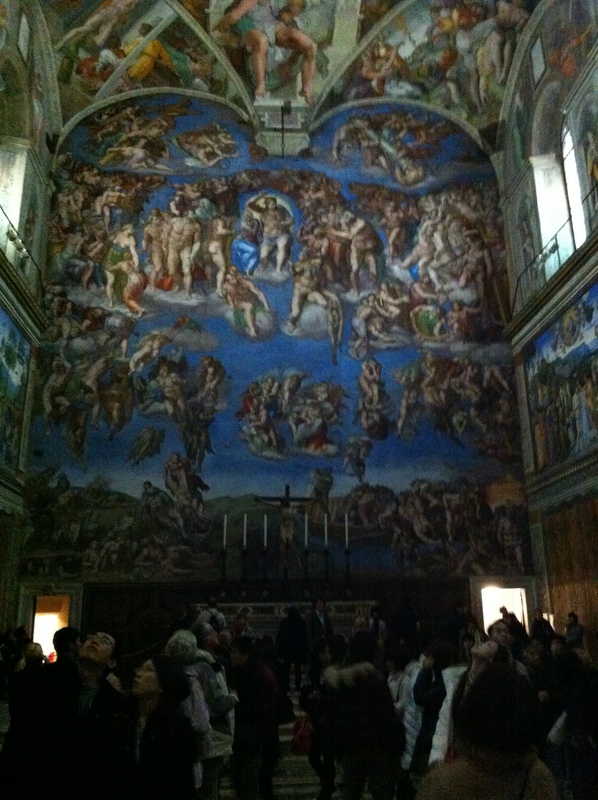 I walked right up to the wall, taking in all of the magnificent details of “The Last Judgement,”. The detail of the faces caught between anguish and salvation shook me with its accuracy and intensity. I took it all in, never looking at a singular picture for a longer period of time in my life. What is there to say about perfection except for how it makes you feel? I could write the description of the picture, but the real mark of a masterpiece is how it affects those who look at it. “The Last Judgement” brings people almost to tears. It is that powerful. Can I call Michelangelo the greatest artist of the Renaissance? I think so. How can one man possess the genius to paint such beauty and sculpt such beauty? It does not seem possible. I then observed the biblical stories surrounding the room and Michelangelo’s Genesis running along the ceiling. My first time through this room I had not been able recognize the stories and allegories represented but time, after reading much of the Bible at BC and taking Rocky’s art history class in Florence I found myself able to recognize most of the paintings. Does that make me cultured? Michelangelo’s “Genesis” might be as impressive as the “Last Judgment” but because I would only repeat the description of the wave of emotions which overtook me while looking at it, suffice it to say that I walked out with those images bright in my mind and my soul afire. Had I really just seen some of the most beautiful art in the world on my last full day in Italy? 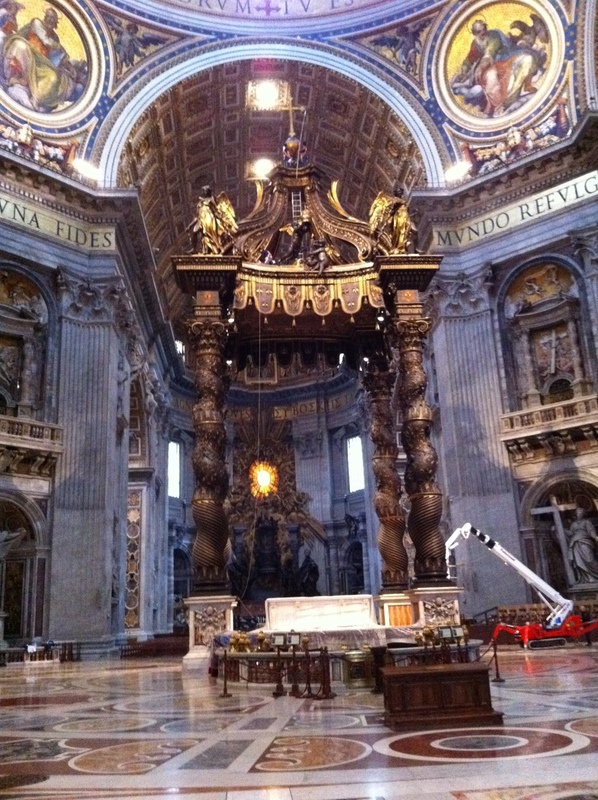 I went over to the Basilica and continued my love affair with Italian religious art. 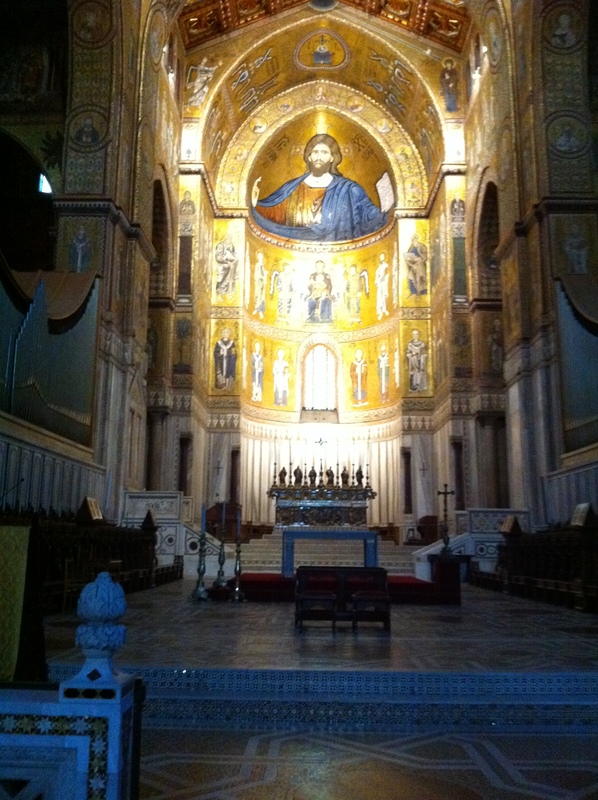 The basilica is massive and ornately decorated as one of the most magnificent Renaissance churches in the world. The most impressive piece in it, however, is once again a Michelangelo. 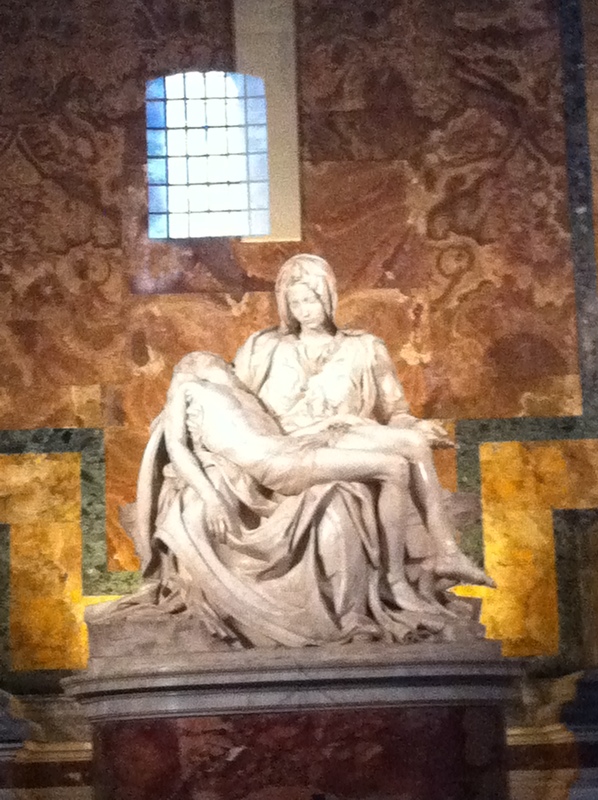 His Pieta`, or pity which depicts Mary holding Jesus’ dead body, happens to be one of the most powerful sculptures in the world. It’s simple and small (and unfortunately sits far away from the viewer) but still one cannot ignore the look of agony and love on Mary’s face as she holds the limp Jesus. Seriously, how did this man do it? I went back to the hotel where I encountered an awake, and seemingly slightly better Courtney. She at least didn’t barbs fever anymore! I checked to see if her bags had arrived yet; they hadn’t. Not only had they yet to arrive, but the airport had yet to find them. This bothered me since we were leaving for America the next morning and I did not want Courtney to lose her bags! We spent a while trying to figure out what was happening before leaving it up to the winds and going to one of my favorite restaurants, if not favorite, in Rome called Sora Margherita. We had a cool taxi driver who spoke Spanish, Italian and English, which made our cab ride quite enjoyable! Courtney still was not feeling fantastic, but it made me happy that she could at least get out for a little bit and have a better impression of Rome than the city near the train station. Plus, we would be having a remarkable meal, what could be better?This happened to be my third time at Sora Margherita, a restaurant about which I blogged in one of the first blogs. They closed for lunch at 3 and even though we walked in at 2:45 they found us a table in the packed restaurant. Courtney, being not too hungry do to her being ill, did not want to eat too much. I concurred so we decided to split a fried artichoke (carciofi alla guidea, their specialty), an order of zucchini that were cooked with balsamic vinegar, a mixed salad and fresh fettuccine with cacio (sheep’s milk cheese), ricotta and black pepper. 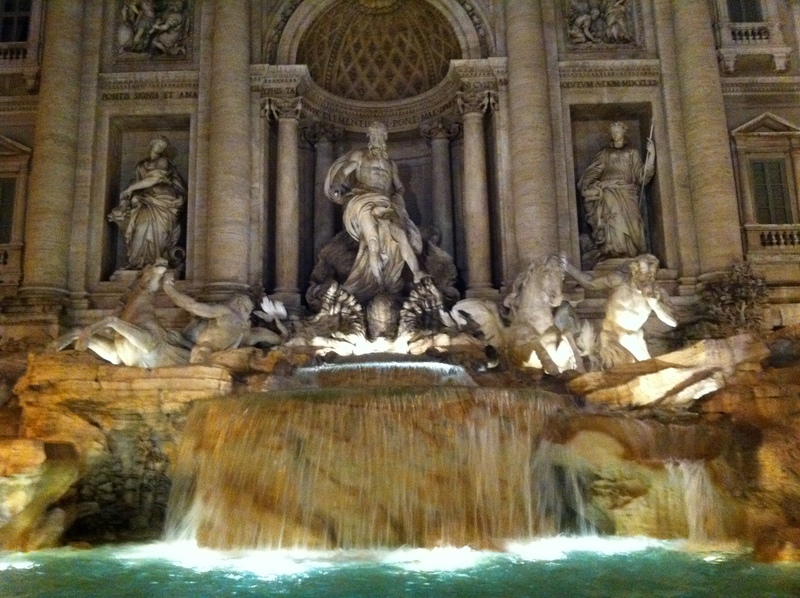 We went back to the hotel to take a rest before I brought her around the Pantheon, Trevi Fountain and Piazza Navona later that night. Her bags had still not arrived and we started to worry that they wouldn’t make it before we left from Rome the next morning. We asked the man at the front desk about the situation who told us that if we had already departed by the time the bags made it then the bags would automatically be forwarded to America. That calmed us a bit, so we went upstairs and watched Harry Potter II. By the time the movie ended it was past 9 and we were starting to get hungry again. Feeling nostalgic, I decided to bring her to the first restaurant at which I ate in Rome, right under the apartment in which I stayed with Mom and Rich for a week three and a half years ago. 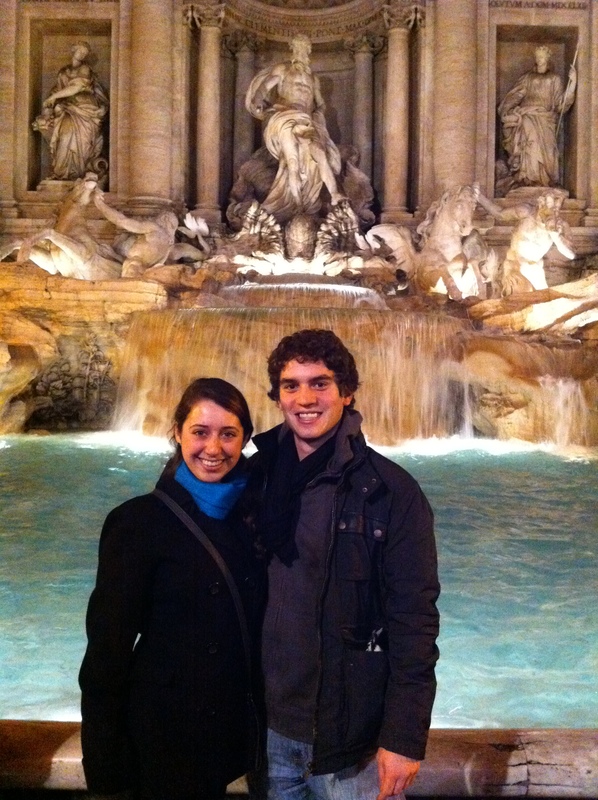 We walked past the Trevi Fountain and found somebody to take a picture of us in front of it. We then walked to the Pantheon and Courtney had fun trying to take artsy pictures of the exterior. We had a very good, but extraordinarily filling, dinner where we shared mozzarella di buffala and tofie (a type of pasta) con pesto and tofie with a sauce of cream, zucchini flowers, prosciutto and saffron, followed by sautéed chicory. All delicious. 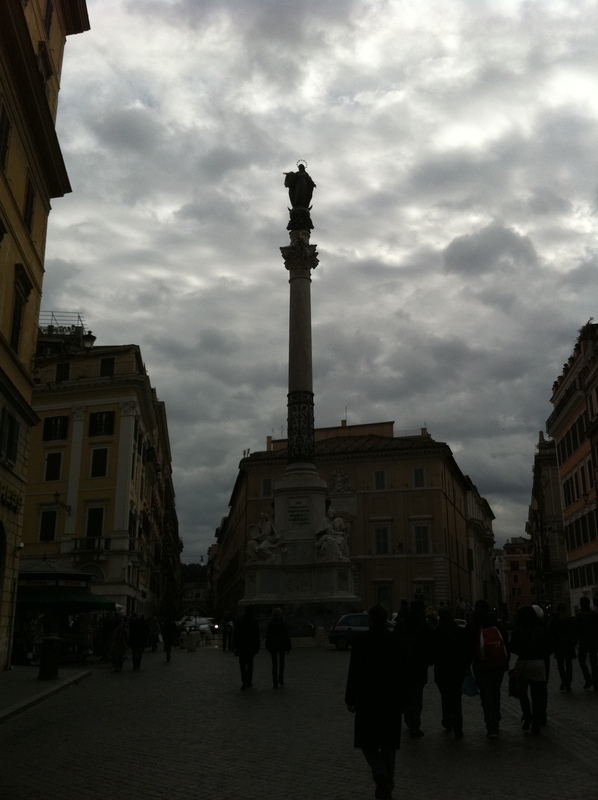 We walked to Piazza Navona before catching a cab home. I felt as if my experience were coming full circle, ending in the same restaurants and with the same monuments as when I had begun. Closure indeed. And closure was something that I luckily had had the time to achieve. Taking a four day vacation with my closest friend of study abroad where we had the ability to dissect, analyze, relive and remember our incredible experience certainly allowed me to bring this semester to an easy end. Courtney, on the other hand, seemed to be struggling with the idea that she would not be returning to Granada for school. She had finished classes on the same day as me, but had stuck around hanging out with all of her friends until she came to Rome, which in all likelihood is what I would have done in Parma had anybody else been staying in Parma. Fortunately, I feel, Brian and I were almost forced (let me qualify this statement…we really wanted to go somewhere, but would have stayed if others were around) to leave Parma immediately and take time to let it soak in. I’ve had a four day head start on Courtney. Then again, the simple reason may just be that I have some crazy aptitude for adaptation. I can move from place to place and be fine in the immediate. As you have seen from my blog, there come times when I analyze and miss home, but departing from one place to another (like school to home or home to abroad or abroad to home) has always been easy for me regardless of everything that I left behind in the change with home being the only exception because I still, in the end, feel compelled to return there. Still, I’m sure that the four days with Brian helped me get a grasp on what had happened in my life. It helped me feel finality and it helped me really appreciate and miss the life I had left behind while simultaneously looking forward to, and anticipating my life awaiting me in America. Brian and I arrived in Rome at 10:30 the next morning, the 19th, and he left for the airport while I went to the hotel. I had said goodbye to Nice in the morning before leaving while she was still half asleep at 6:30. So, either because she was asleep or because of her general positive nature, I did not feel the gut wrenching unhappiness at leaving which I had envisioned myself feeling. I will see her again, I’m sure of it. Brian’s departure, however, was a bit harder because it finally signified the end of Parma. I know I’ll see Brian soon and that I’ve made a life-long friend with whom I plan on spending lots of time in the future, but his leaving left me alone in Rome, as I had started this adventure, waiting to go back to America instead of waiting to begin a brand new semester in Italy. How could I possibly say goodbye to this place? Well, I was in Rome which meant that I had plenty of things to see and occupy my time until Courtney arrived that night from Granada. 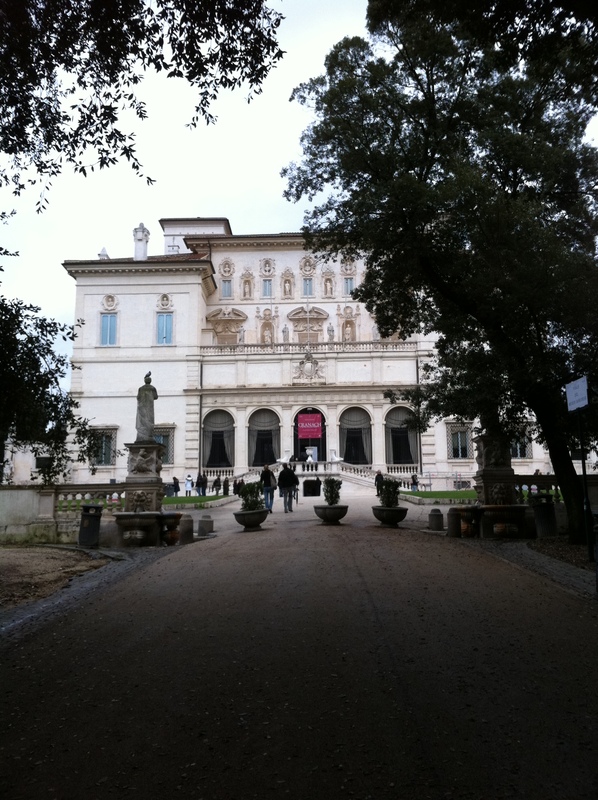 I dropped my stuff off at the hotel and went to the Villa Borghese where I had reserved time to visit the museum from 1-3. I had not been there in three years but once I found the museum, located in a giant park, I instantly recognized where I stood. An accordionist played beautiful music on the ‘via’ leading up to the museum. I walked around the fountain where three and half years ago I sat wearing a Michael Jordan jersey (not acceptable style in Italy) in the middle of summer with Mom and Rich as we waited to enter. How had it taken me more than three years to return to this temple of Baroque art and Bernini sculpture? 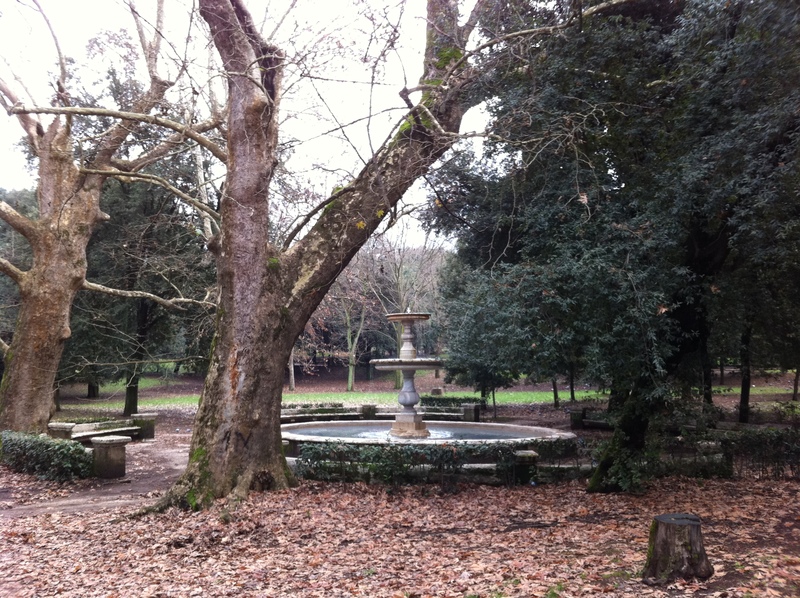 I blogged sitting on a park bench in the slightly chilly, damp air and enjoyed the music. Life was good. I was seeing one of the most beautiful museums in the world and would be joined tonight by my wonderfully amazing girlfriend Courtney. stunned by the floor to ceiling marble, decorations and frescoes. In each room a sculpture lay at the center, usually of Bernini, surrounded by other priceless pieces of art that gave each room a theme. There was the David room with Bernini’s magnificent interpretation of the topic surrounded by paintings of the same biblical story. There was the room of Emperors where porphyry busts of Roman emperors surrounded tables of porphyry and mythical sculptures. Throughout the entire museum composed as such, the most stunning sculpture, one where Apollo attempts to kidnap a woodnymph who asks her father to be turned into a tree, is, ironically, the one in a room entitled ‘The Gladiator Room’ which has little to do with the central sculpture. This sculpture, though, is second to only the David in its magnificence. Bernini’s masterpiece captures the moment that the woodnymph begins to turn into a tree as she pushes Apollo away who is grabbing at her waist. The faces are so real that one thinks the transformation is actually happening. Her hands have begun to turn into branches with leaves extend out of them seeming to suspend in the air and her body has begun to transform into the trunk of a tree. Leaves flutter around her as she turns to escape Apollo. There is motion, there is reality. The flesh of stone looks too real so that I honestly thought I could touch the sculptures and feel human. The sight literally takes the breath away. How could anybody capture such emotion, such motion, such reality in stone? How can one express this reality with a chisel? The sculpture is too real to be stone, it seems impossible. Yet there it is, sculpted from a single block of marble. I looked at it for a very long time walking from the back to the front, as Bernini meant it to happen, so that I actually saw the wood nymph transforming in her attempt to escape Apollo. Walking around the sculpture was like watching a short movie with a beginning and an end. I could barely believe it. Unfortunately, while I was staring at one of the most impressive pieces of art which I have ever seen, I received a call from a very sick Courtney who told me that the Granada airport had been shutdown due to tornado like conditions and that she would have to take a bus to Malaga, fly to Barcelona and then catch a flight to Rome. It seemed too much, but I figured she would make it to the city eventually. The beautiful museum, and my general lack of sleep for the past week, left me too tired to continue sightseeing. I went back to the hotel and spent the afternoon hanging out waiting to hear from Courtney. She boarded a flight to Barcelona at 5, meaning she would miss her 6 o’clock connection to Rome, but I was still confident that she would make it. She told me she would call when she landed. The hours ticked by and come 8:00 I had still not heard from her. I was extremely worried, as Courtney’s mom knows, but unlike in the past I did not begin to freak out or panic. She would call me and she would make it eventually. I had to leave for the airport at 8:30 regardless to pick her up. As I was preparing to leave we finally heard from her. She would be landing at around 10:15 in Rome. I relaxed and went off to get her. Still, regardless that I was worried, I feel that I have begun to improve on my anxiety and pessimism. What could worrying do about it? Courtney would make it eventually. The saga was not over, however. At the airport I found Courtney near baggage claim looking absolutely miserable and sitting next to an empty turnstile. She was feverish and really sick. Her bags had not come and in her sickness she had to deal with the emotions of leaving Granada behind, besides the horrendous day she had traveling. I took her to the customer service desk where we were assured that her bags would arrive at the hotel the next day. I brought Courtney back to the hotel and tried to put her to bed. It was nearly one when we got home and we had reservations for the Vatican at 8:30 the next morning. We woke up at 10:00 and began the long day of travel that involved a bus to the airport at 12 (during which we drove along the coast on one side and the mountains on the other with incredible views of both), a flight from Palermo to Bologna at 3:30, a bus from the Bologna airport to the train station at 5:15 and finally a train from Bologna to Parma at 6 that arrived in Parma at 7. 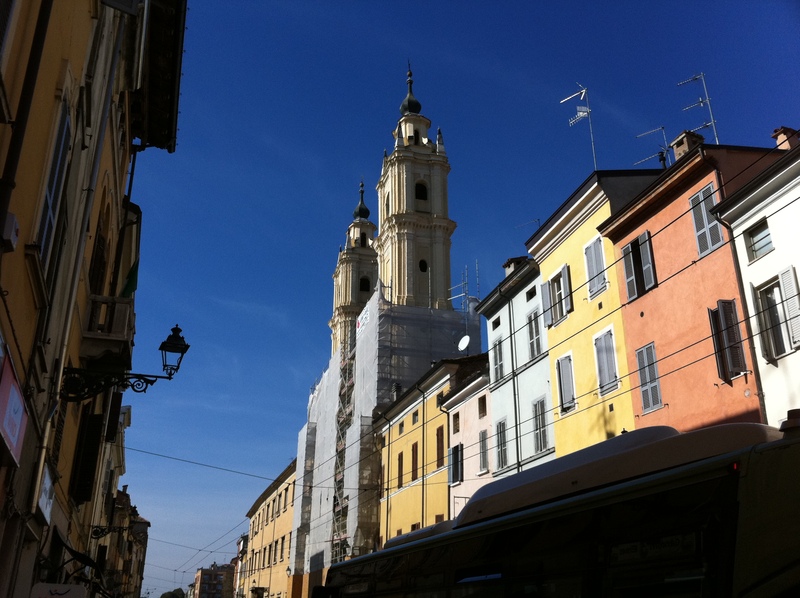 Yes, Europe is small and travel is relatively ‘easy’, but living in Parma, without a major airport nearby, meant that we would have to take the train and then most often a bus or shuttle train to any airport from which we needed to travel. That was most likely the worst aspect of Parma, which in the end caused a lot of stress and money spent (sorry Dad and Chris! ), but nothing serious that stopped us from enjoying life. 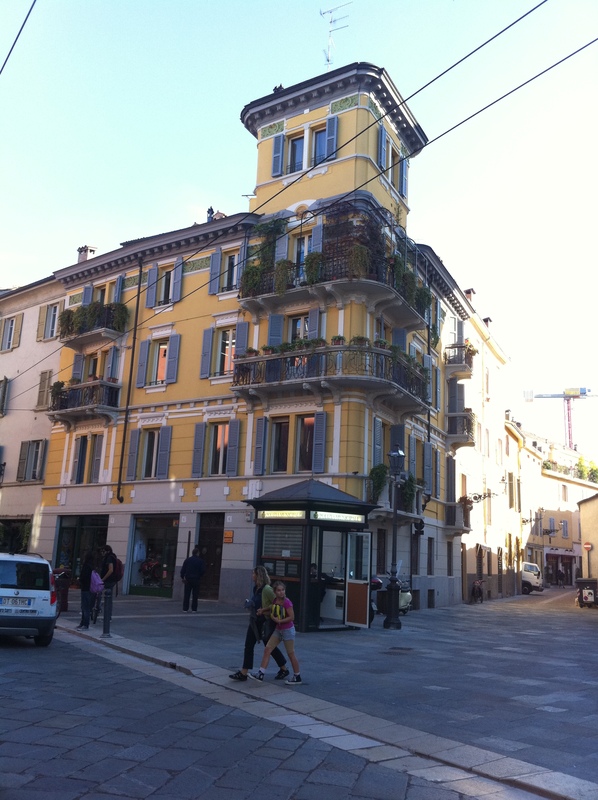 Once in Parma we walked to Piazza Garibaldi where I was meeting Andrea to say goodbye to my wonderful tandem partner. We walked around and talked for a bit and said goodbye. It was sad, I didn’t want to leave. 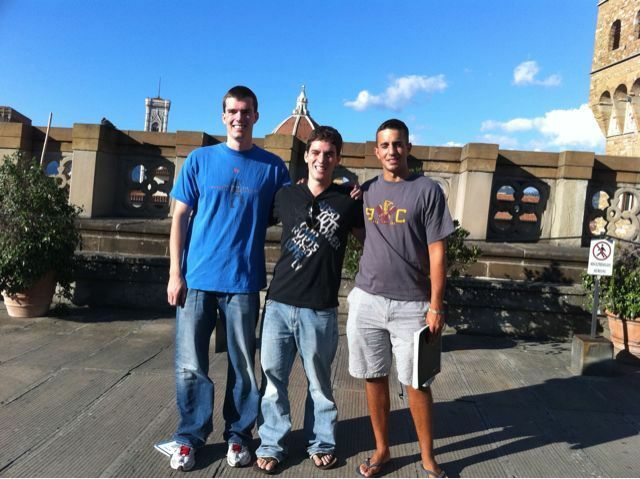 I felt like I hadn’t gotten to know him enough and that if I were to live in Parma we would have been great friends. Still, we are good friends and he said that he will be coming to America this summer and I hope that he comes to stay with me. By the time I got home it was close to 8 and Brian and I had dinner reservations at Hostaria da Bepe, our favorite restaurant in Parma at 9:30 and neither of us had packed. It was going to be a race. 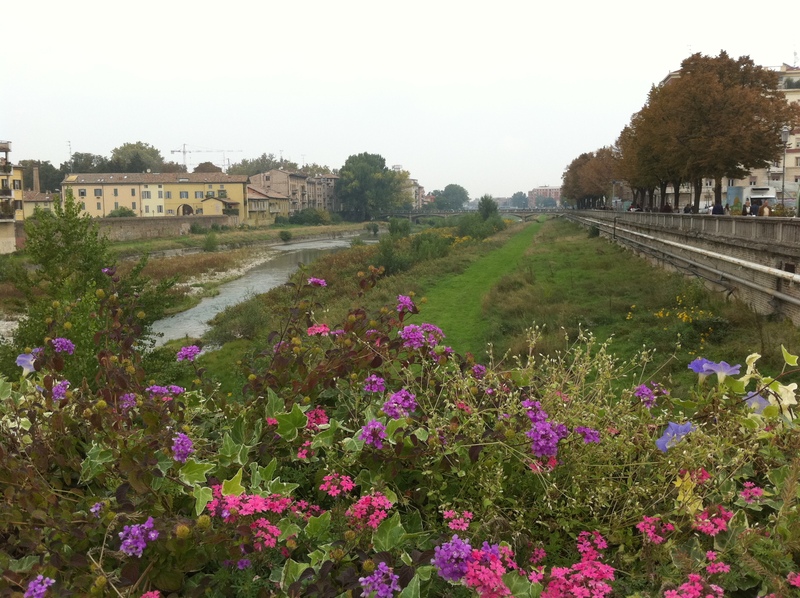 I walked over the Ponte Mezzo from the center of the city to my side of the river for the last time. I looked at my house across the river, I looked back towards Piazza Garibaldi and I became close to overwhelmed (and even am now thinking about it). Those would be my last times this semester making that walk, the last time that I would view my cozy house from across the river and the last time that I would meet up with friends in Piazza Garibaldi. Seriously, come on! It couldn’t be coming to an end! One of the strangest things that I have noticed since departing Parma is that it is not the thoughts of people or relationships ‘left behind’ in Parma that bring me sadness but the thought of the little things; my room, the walks, Piazza Garibaldi, the Duomo and the Baptistery, my park. Thinking about those, honestly ‘insignificant’ pieces of Parma in light of the importance of Nice, Anna, Andrea and Giordano seems strange to me. Why is it that those make me sad? Is it because I have more faith (or at least know that I can) stay in contact with people because I can communicate with them whereas places are inanimate? In all likelihood it is because those places represent really personal moments in my time in Parma where I walked by myself and observed Parma on my own. 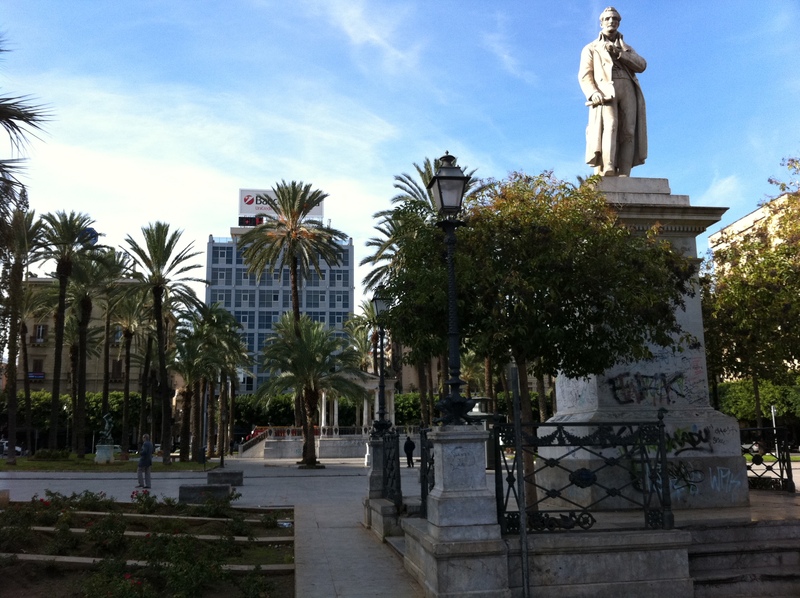 It became my city and these monuments in the city are representations of that city which adopted me and which I adopted. 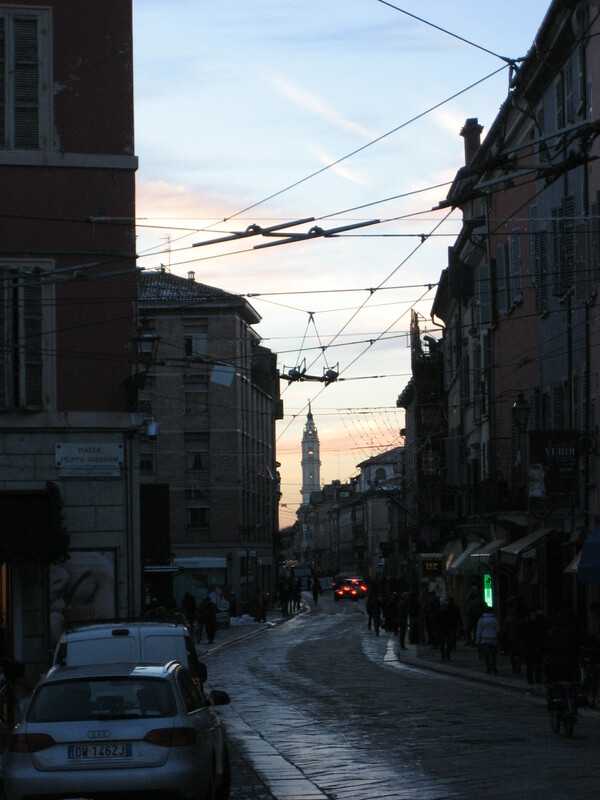 The people of course adopted me as well and loved me more than any object could, but they are not what I imagine when I think of the city of Parma. I think of the buildings and the streets, the river and the lights. I think of my walks and my time observing, while simultaneously lost in my own thoughts and considerations. The people I envision as the program and those connected to myself in the sense of studying abroad. They were my keepers and my friends in the sense that I am a person (which is incredible), but the city itself was my realization that the city was mine. I know it inside and out and I loved it, and now, sadly I was leaving it behind. The goodbyes only continued when I got home. I had to say goodbye to Annetta, the wonderfully vibrant 93 year old who told me to consider her my Grandma when I was leaving. That was hard. She is beyond sweet and we had plenty of fun conversing where I could sometimes barely understand her, or she would sit among us at dinner and laugh at how she understands nothing in English. Luckily I didn’t yet have to say farewell to Nice who I would see in the morning. I went downstairs and began the process of fitting my life into one suitcase (good thing I am a very organized packer with a big suitcase!). I threw away a bunch of old clothes, which felt good, and while I was at it, Giordano showed up to say goodbye. He hung out and we chatted about life, the group, my time here, his hypothetical trip to America (which I hope happens) and how hard it was for me to leave while at the same time I couldn’t wait to get home. By the time 9 came around and I had to start getting ready for dinner, I had nearly finished packing. My bag was stuffed! Giordano left after a long goodbye, but I know I’ll see him again and know that I’ll talk to him soon. Thank you modern technology! 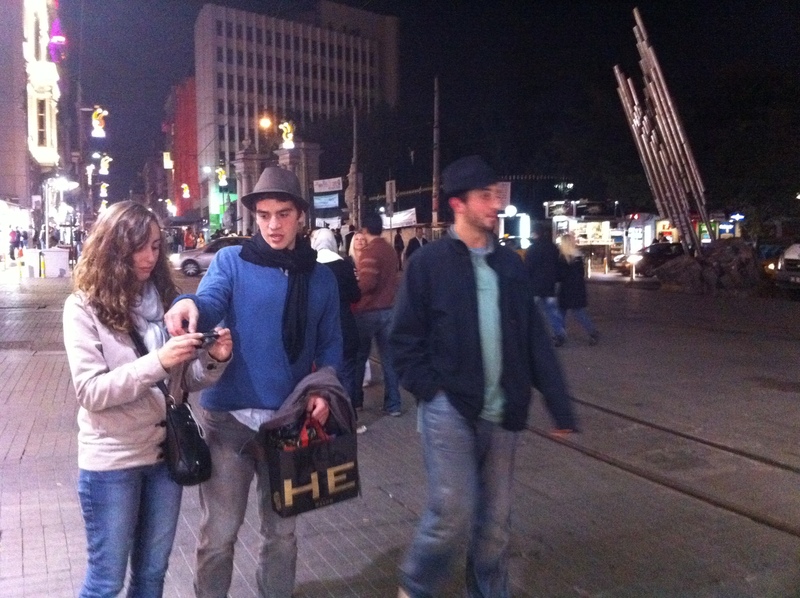 And Brian showed up around 9:20, wearing his fedora that we bought together in Istanbul and had been wearing every night that we went out together since. “I see you’re wearing the fedora,” I said. “Of course. It’s tradition. Did you honestly expect me not to?” he responded. And I knew he would be. I put on mine and we walked to our final meal. The city was cold and beautiful and we chatted about the feelings of leaving this walk and leaving this city that we had come to know so well. How could it be that this had come to pass? 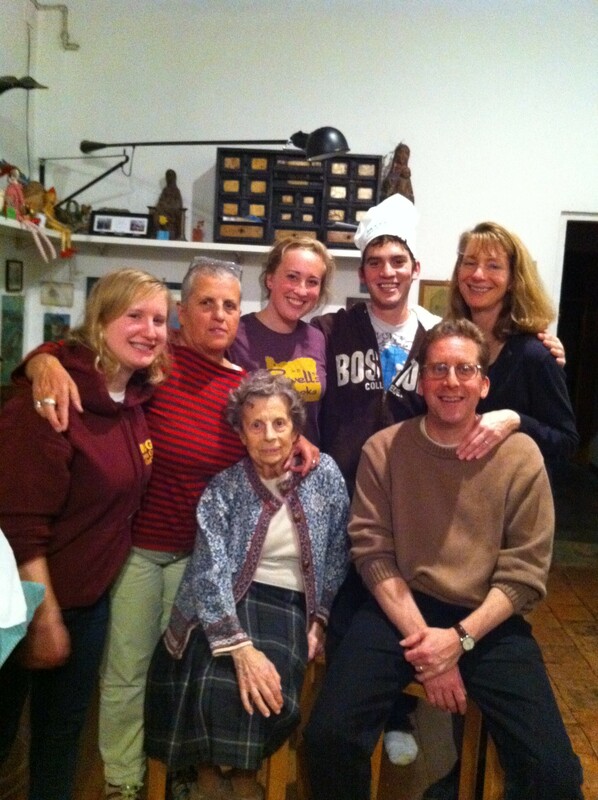 We made the familiar walk along the cobblestone streets and arrived at a packed restaurant. Good thing we made reservations. We sat down at 9:30 and didn’t receive the menus until 10 (the service is a bit slow here), but both of us were happy about it. We wanted the meal to take as long as possible. In fact we never wanted it to end. Immediately we began lamenting the loss of such high quality food (at unbelievably reasonable prices). Where would we find this risotto in America? The answer; our own kitchens. Brian wanted to learn the method of risotto, so I described it and promised to show him start to finish once we were at home. Throughout the night intermingled with our normal conversations about the failures of American politics and the NBA once of us would break out every now and then with exclamations such as ‘how could this be it’ or ‘come on, come on! Why are we leaving?’. The night was nothing except nostalgic as we toasted to this and that, including to finding a friend neither of us expected to find in a city we had never previously imagined visiting. For our antipasto we gave into the temptations of Parma and ordered a plate of prosciutto crudo (raw), which after the plate of Parmigiano Reggiano cheese provided to us with bread, completed the major tastes of Parma in two dishes. We had our cheese and our prosciutto di Parma, which was incredible. Where is cured ham in America we wondered? How did we miss the boat with that one? 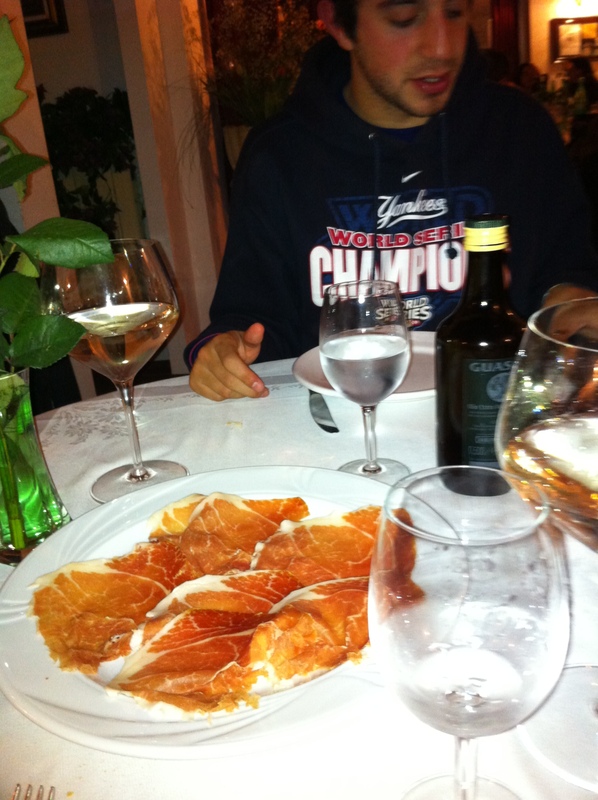 Even our imported prosciutto never can compare to what we ate in Parma. Something gets lost in translation. For primi we could do nothing but order risotto. We each wanted to have the plate with three different types of risotto but to do so would mean that we would each have to eat the same kinds if risotto. He ordered pumpkin, I ordered mushroom and more wine. 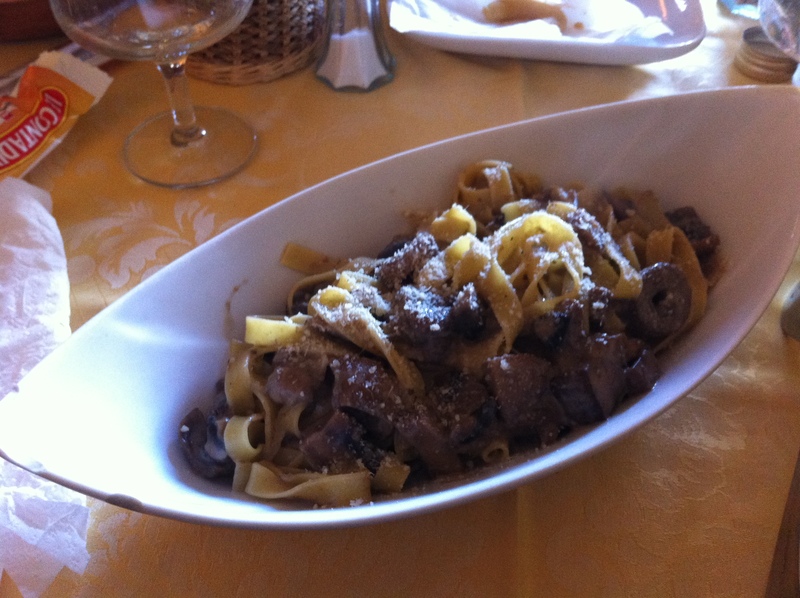 When the plates arrived, however, we each had half a plate of zucca and half a plate of funghi…yes!!! The pumpkin was sweet and creamy which completed the earthy mushrooms perfectly. We didn’t mix the risottos but eating one and then the other gave the perfect balance of sweet and savory. 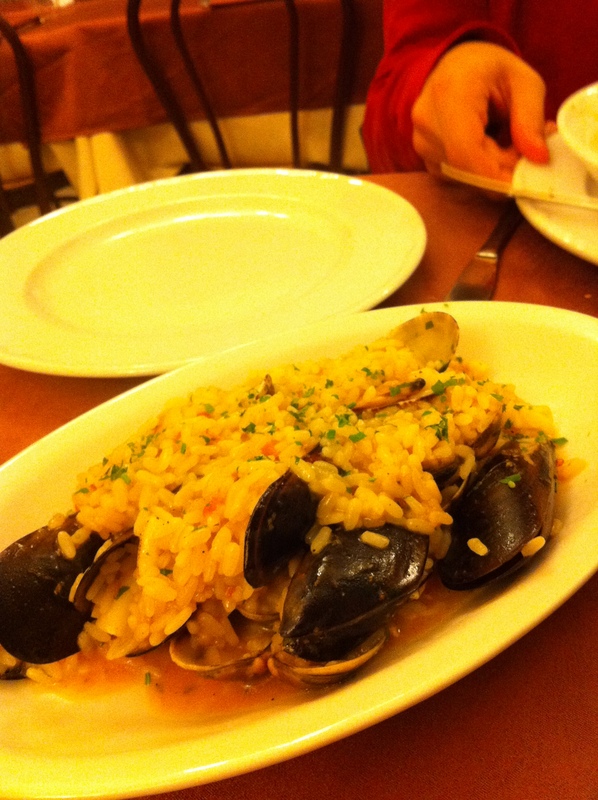 We ate slowly, savoring each and every bite of the best risotto I have ever tried. We said little except for the inevitable ‘why is this over?’. Where was Hostaria da Beppe in America? How was this chef so talented. 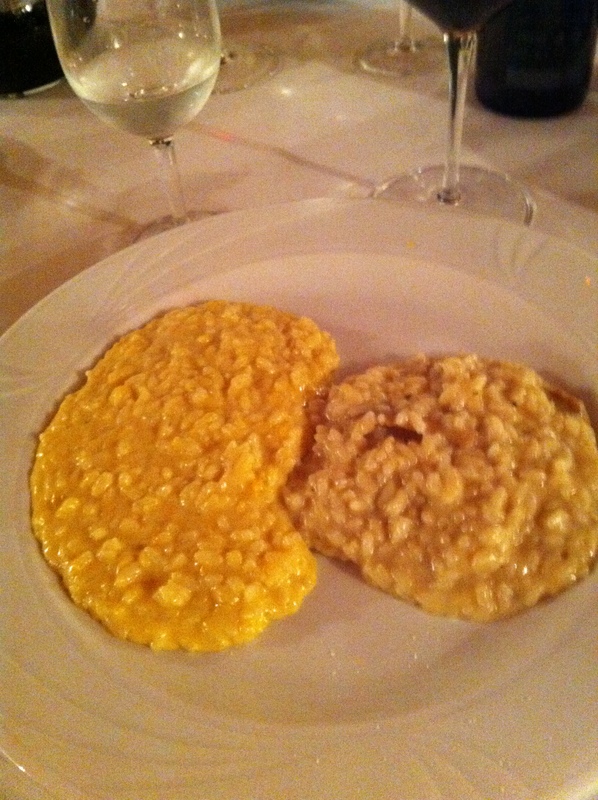 His risotto is a work of art presently plainly on a white plate with now frills. My last beautiful bite went down and I sighed. The end still hadn’t hit me fully. I was too full to eat an entire secondo so I ordered grilled vegetables while Brian got the brasato di vitello a barola (braised veal cooked in Barola wine), which my Dad ate when he was in Parma and is undeniably fabulous. Our vegetables came out and instead of one order they gave us half an order each, which was still too much food for me. Then Brian’s veal came and another plate of vegetables! I tried, but I could not eat another bite. We were too of the last people in the restaurant so by this time the chef had come outside. We thanked him graciously for giving us a semester of tremendous food and ever lasting memories. Our last meal in Parma was through and it was only fitting that I ate it at the best restaurant in Parma with Brian, the person with whom I ate my first meal in Florence sitting in a piazza and munching on goods from the Central Market. We found a nice taxi driver who took us from the center to Brian’s apartment to get his luggage and then to Nice’s where we spent the night. We got home at 1, but I didn’t fall asleep until 3 when I had finished packing, cleaning and writing Nice a letter in which I did my best to express my gratitude. It was the end, I could see it all around me, but ai refused to believe it. Our plan for our last full day in Palermo involved going out of the city, via bus, to see the Duomo of Montreale which is supposed to be one of the most beautiful sites in the world. We used the New York Times to figure out where the bus stopped and once again used the iPhone to find out how to get there, which once again lied to us (It must not know Palermo very well)! 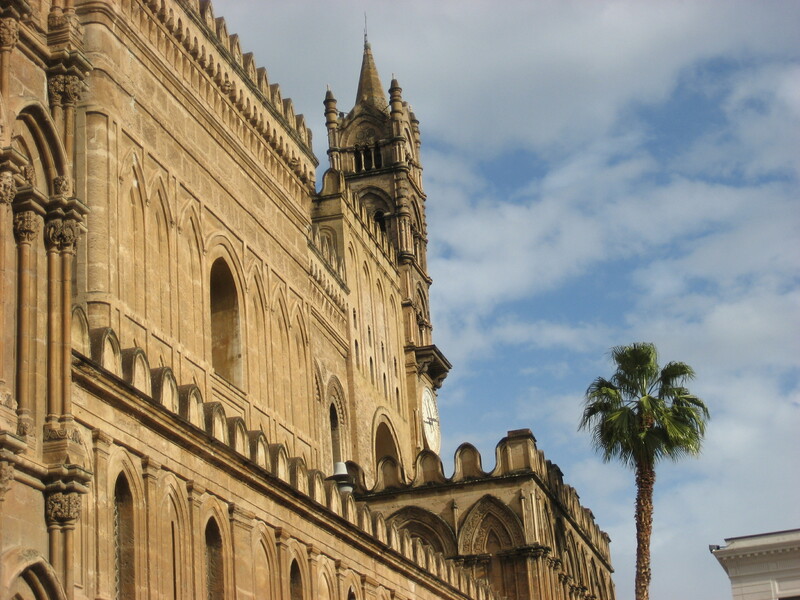 We walked forty minutes, back to the train station where we originally entered Palermo, only to have to turn around and walk to a piazza ten minutes in the other direction from our hostel, so almost an hour from where we were standing! We took a bus, found the bus stop, and after nearly 2 ½ hours of searching for this bus, boarded it and went out of the city. This is where we experienced the Palermo traffic for the first, but not the last time. The bus crawled along, avoiding cars and scooters and parked vehicles. Literally every possible inch of road was taken up by cars or trucks or whatever. Well, Brian and I had nothing to do. We figured the church would be closed when we got there (as most are during the afternoons) and we would get something to eat beforehand. 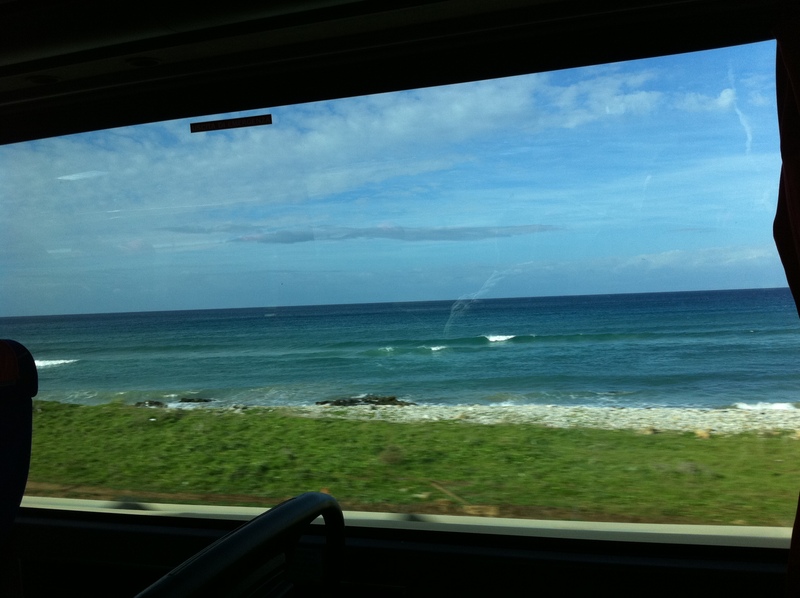 The ride out of the city, however, was gorgeous. 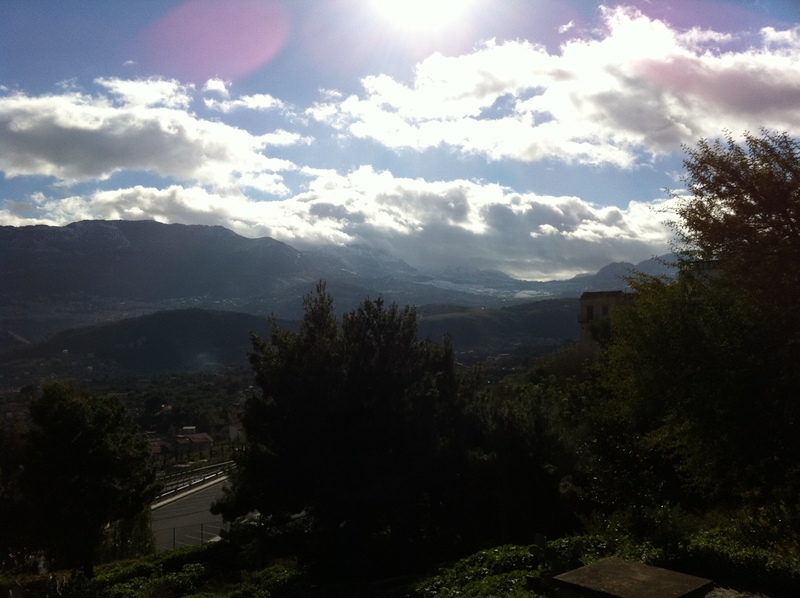 We went up into the mountains and began to get beautiful views of the city in the distance under the mountains. We got off of the bus at the church, which was stunning from the outside, and decided to use Brian’s Blackberry to find the best restaurant in Montreale. One was recommended, but the directions were unclear. We would have to search. And search we did, for nearly 20 minutes, ten of which were used to take pictures of the gorgeous view from behind the church where we could see Palermo on the coast surrounded by mountains. It was the most unique scenery I have ever seen and the first time that I had seen a coastal city from the mountains (excluding New Haven on the Long Island Sound, which really doesn’t compare). Stunning. We finally found the restaurant after asking at the tourist information. We had to follow the winding, small back roads of Montreale around the church, but soon Brian spotted the place in the basement (or what looked like the basement) of a residential building. The place was empty except for another couple because in the winter apparently Palermo is not very busy. We were hungry and ordered a feast of hot antipasti, a pasta each and a second each. I had fettuccine with porcini mushrooms and Brian had gnocchi with a cheesy tomato sauce. For seconds I had grilled eggplant alla greca (which tomatoes, feta cheese and oregano) and Brian had beef carpaccio. The food was fantastic (my fettuccine and eggplant were actually unbelievably delicious now that I think about it) but we ate too much. Who the hell cares? We were on vacation. And then we started the conversation about ‘vacation’, the idea of it and how to live it. Our mode, obviously given the massive amount of site seeing we had done the day before, was to relax and not ‘force the fun’. We would do what we wanted and see sights, but most importantly we would eat well and relax. We had no desire to rush around and try to see everything at once, because there is no point in doing that; you won’t enjoy yourself and you won’t enjoy the sites. Plus, if you don’t see everything then one day you will have to return to fill in the gaps and we both agreed that we would definitely come back to Italy. Vacation is a time to enjoy oneself, not to run around a city or a country in a limited amount of time trying to see everything because there will always be the next time! Finally we entered the church and it was incredibly dark, a bit too dark given the insanely brilliant mosaics which covered the walls. 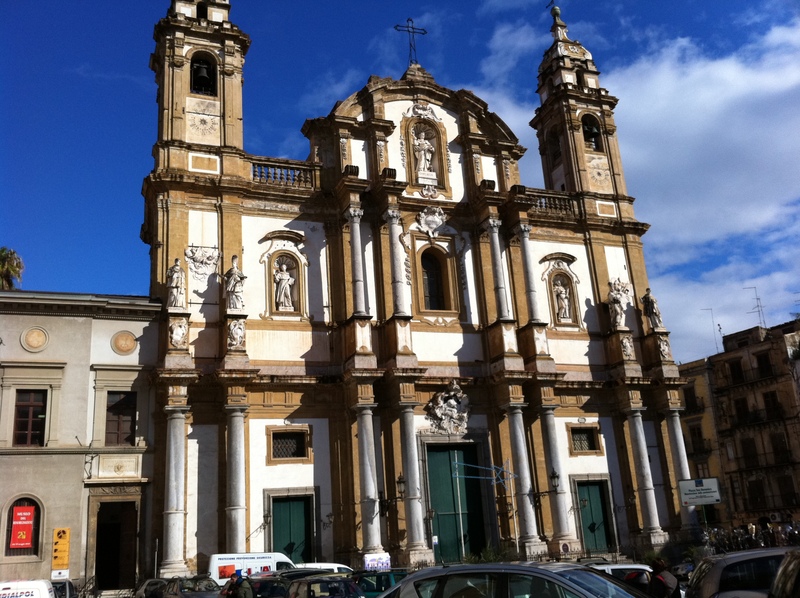 It was like the first church we had seen in Palermo but on a much grander scale. Every wall had a different biblical story, including the story of Noah which is one biblical tale I had never before seen represented in painting. Of course the altar was gorgeous with a mammoth mosaic Jesus surrounded by the disciples and the holy family. Everywhere inside was beautiful enough to take the breath away, but the place was so dark that it was hard to see the mosaics let alone take a picture! I’m not sure why they could not have provided artificial light to supplement the meager natural light of the day. Regardless this church was magical and awe-inspiring. Seriously, how did people create on such high levels back then? What has happened to that artistic tradition? Why aren’t public structures as incredible as they were back then? Well, for one the Church and Holy Roman Emperor (I think) paid for this one, which immediately means unlimited wealth with which to construct projects that today would cost unimaginable amounts of money. I wish it would return though. Art of all kinds, especially when paired with architecture, brings out the emotions in people. It inspires people and it makes them happy. Beauty in the world tends to do that and it seems to me that our modern lacks some of the serious, powerful and enjoyable art that brings so much beauty into the world. We took the bus back to the hostel and vegetated for the rest of the afternoon before once again using the New York Times to find ourselves a well-reviewed and highly recommended restaurant (or maybe we found it walking around and then through Trip Advisor), called Trattoria o Maestro del Brodo. Interestingly there were two restaurants using something del Brodo as the title within a minute walk of each other. We had walked past one the night before and it looked good so I thought we were headed there, but Brian thought we were headed to the other. Before going to dinner, though, we decided to wander around and find a place to serve us aperitivo, without the food. Basically, we wanted to have a predinner drink. In our last couple of days of walking through the city we had not seen anything resembling a place to which locals went for a drink or to hang out, but that night we followed some lights in the distance and ended up in a fairly crowded local place where the bartender instantly knew I was American and where we were able to have a glass of nice wine, something I will dearly miss when going to bars with friends in America because drinking wine while at an American bar really does not happen. We talked about basketball and the resurgent Knicks who were playing the Heat that night (let’s not talk about the outcome) and how excited we were to get home to watch basketball. And that is one of the strangest aspects of leaving from abroad; the divide between wanting to go home and not wanting to leave Italy. Our hearts were divided between the old and the new (in either way you look at it between our old lives and our new or the old world and the new). When we thought of home and the excitement of returning to Boston College, or watching the Knicks on TV, or hanging out with our friends from home, or seeing our families, or just being able to do nothing we became happy. But then we realized that the weekends would come and go without the question ‘So where are you going this weekend?’. How would we be able to return to a life without constant travel, without the beautiful sensation of traveling to a new country or a new city every weekend? We would remain at BC with the question of ‘So where are you going out tonight?’, which honestly could not excite me less. “What do you mean I’m not traveling to somewhere spectacular every weekend?” Brian asked, “Am I really supposed to stay in one place for an entire semester? How boring is that?” We had become men of travel, men on the move, men accustomed to a life of excitement and culture and new. How could we leave that behind, but how could we not return to our lives and family (including friends) at home? In the end, no matter how much our hearts were being pulled in two, we knew that it was time to go home, regardless of whether we were fully ready for the change or not. Europe would be here when we returned. We walked to the Brodo restaurant to which I thought we were heading, but Brian corrected me (the reviews had said one was much better than the other) and we found the other Brodo quickly. We walked in to a wave of perfumes wafting from the antipasti on the counter and from the kitchen preparing the freshest of fish. Neither of us had cash and of course this restaurant did not accept credit cards (as most places do not in Palermo because they can avoid paying taxes in that way and so that the mafia can own them) so Brian had to run to an ATM while I ordered us more wine and scrutinized the menu. It was not the largest menu in the world (which I have repeatedly claimed as a sign that a restaurant knows what it’s doing), but I wanted to eat everything. In fact the smell of the food and the sight of what the other customers were eating made me hungry even after the massive lunch I had eaten in the afternoon. Brian returned and we ordered. For antipasti he got Zuppa di Vongole (clam soup) and I got Zuppa di Cozze (mussels soup), followed spaghetti alle vongole (spaghetti and clams for me, which I had seen brought out to another customer and might be my favorite food in the entire world) and risotto al mare for Brian who continued his self-proclaimed infatuation with risotto. Was this enough? Nope, for secondi I ordered the fish of the day and was allowed to choose my fish from the display of the catch of the day while Brian got veal. Most of the conversation that night was about the food because course after course (especially in the antipasti and primi as is the case in Italy where appetizers and pastas or rice dishes generally outpace the main dishes of meat or fish) blew my mind. 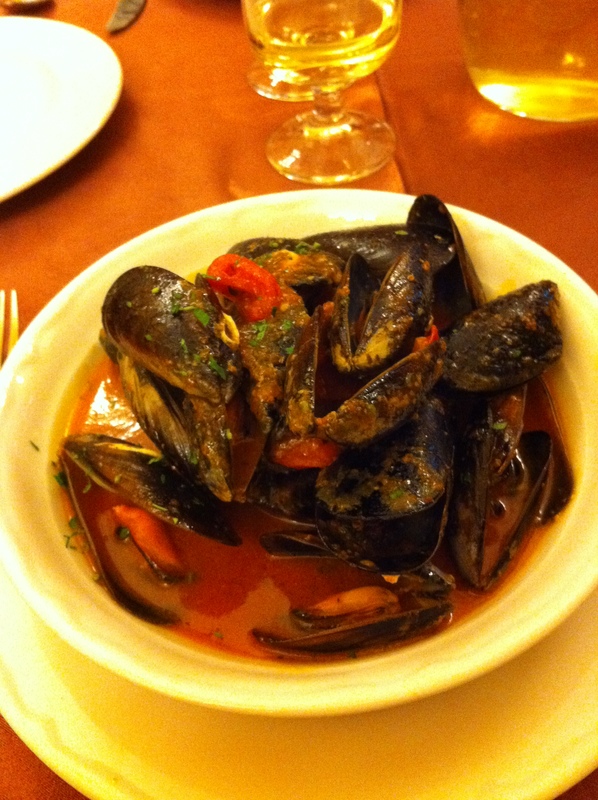 Our zuppe arrived which were bowls of clams and mussels over a reddish, tomatoey broth. Now, I know that I have bemoaned the combination of shellfish with tomatoes because the damn tomatoes overpower the shellfish, but this was the exception. The broth only hinted at tomatoes and spices while overwhelmingly tasting like the liquid released from shellfish mixed with wine and garlic. I couldn’t get enough of it. At home, one of my favorite meals to make for family dinners is mussels (because we do not have clams of nearly the same ability and taste in the Northeast) steamed open in a broth of white wine, butter, garlic, parsley and some chili flakes. The cooking liquid is so delicious that I could spoon eat it, but had never even considered that in the past, preferring to soak up the liquid with bread. Here, however, the dish was called a zuppa (soup) so we were immediately encouraged to spoon the delicious, simple broth into our mouths. We could barely speak and when we did it was only to praise the beauty of fresh Mediterranean fish that was allowed to give off its full flavor. Then the primi came and I could have cried from happiness. My spaghetti was fresh and covered in a thick, clammy broth, one that I have tried to achieve at home for years but never can because of the lack of starch in my pasta water. Restaurants cook batches of pasta over and over in the same water which makes the water incredibly starchy and therefore incredibly able to thicken sauces. Plus this pasta was fresh meaning that it was starchier than the dried version. As such the clammy liquid surrounding my delicious, small clams and al dente pasta delivered the best spaghetti with clam flavor I have ever had. Nothing even came close to it. I ate slowly. I still taste it. WHY DON’T WE HAVE SUCH GOOD INGREDIENTS IN AMERICA? It’s killing me! 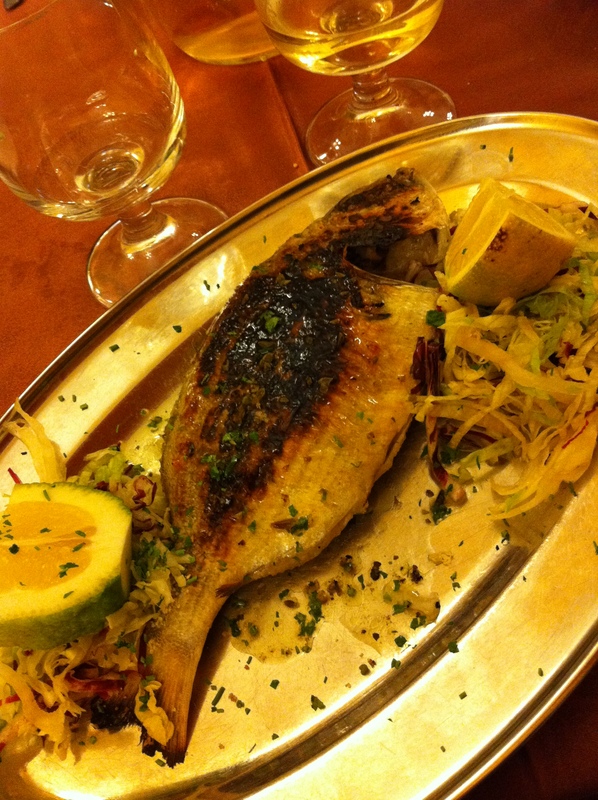 Our secondi arrived to our more than full selves, but the whole grilled fish in front of me was too appetizing to pass up. I squeezed some lime over the top and enjoyed its white, fleshy flavor. Delicious. By this time it was close to midnight and we were exhausted. 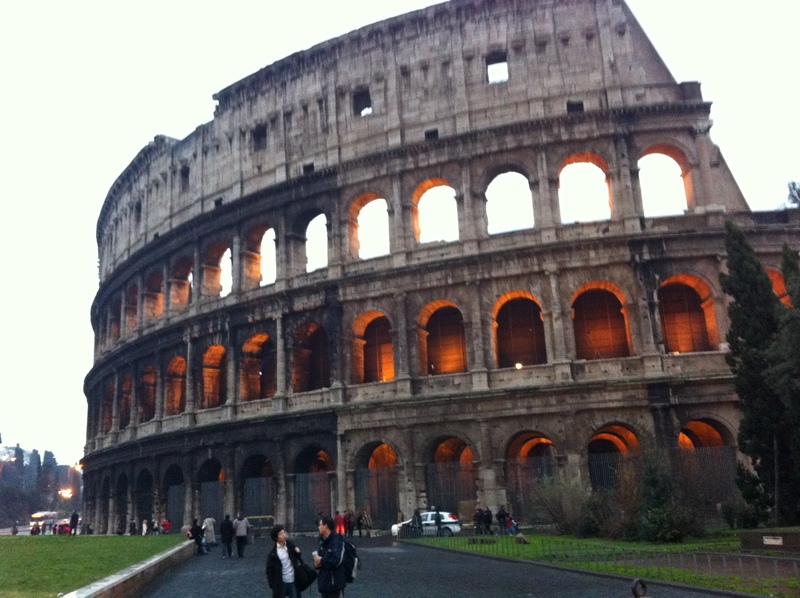 Tomorrow, as we knew would be a horribly long day, followed by a potentially stressful morning traveling to Rome. Neither of us could believe the Palermo trip had already passed us by. Hadn’t we just arrived yesterday? 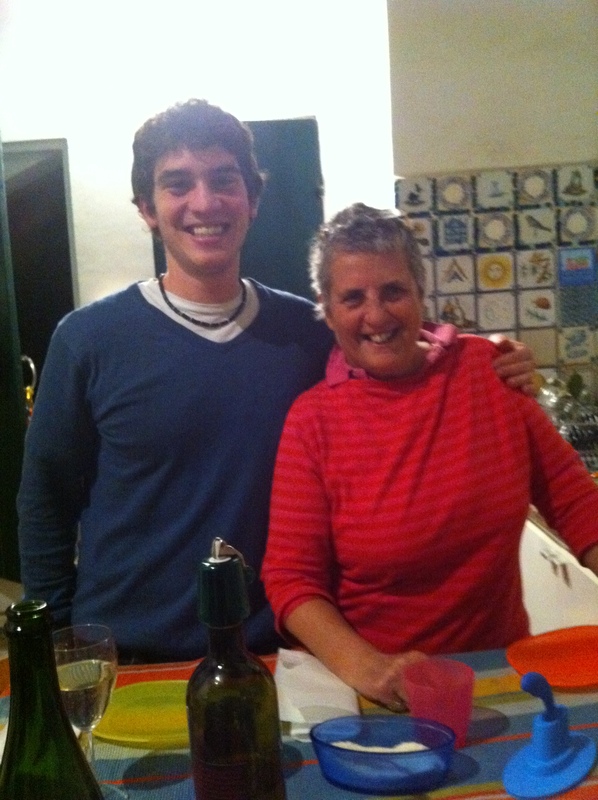 Neither of us could believe that tomorrow would be the final day of Study Abroad Parma Fall 2010. Hadn’t we just gotten to Florence two weeks ago? Everything was there in our minds as if it had happened yesterday instead of months ago, but Time refused us the benefit of the doubt and sped on like a 747 jet. Tomorrow, we knew finally, would be it. The next morning we woke up relatively early because we wanted to walk around the city see the Duomo and a few other sites before lunch. Before leaving I read some more of the New York Times magical guide which told us that we had to stop by a certain pair of churches near the center of the city, one for its unique exterior red domes (very Muslim, I would say) and one for its 11th century interior mosaics and paintings. I used the ever useful iPhone to find that they were literally next to the hostel and on the way to the Duomo so we stopped in for a peak and my breath was taken away. Though the Church was dark (it was raining outside) the gold mosaics, still in pristine condition sparkled. Inside the golden backgrounds were colorful, and realistic, mosaics of religious figures, of course, that made me question if they were mosaics at all. The entire ceiling and most of the walls were covered with these mosaics and the entire altar was a giant mosaic of Jesus. It was incredible. From there we walked to the Duomo which has a gorgeous exterior harmonizing many of the great architectural movements of history into one building, but a disappointing interior that lacks any real flavor or feeling. After the Duomo we wandered to the Teatro Massimo, which is a giant opera house built in almost the same style as the Roman Pantheon. We thought we could get a free tour so we entered the house only to find that it was for ticket sales. There was an open door, however, so we treated ourselves to a private tour of the interior, which looked overall like any other opera house, unless we missed something as we tried not to be discovered. We did some more walking and a lot of talking. We wandered through a market on a narrow, windy side street that ended up being a food market. We bought some of the best, if not the best, green olives that I have ever eaten in my life and marveled at the beautiful fish on display by the many mongerers. It was close to lunch so went back to the hostel to figure out where we wanted to eat. We went right back to the New York Times and it told us about a “restaurant” (it was actually unlicensed and protected by the mafia according to the review) that served incredibly fresh food at incredibly cheap prices. There was no written menu and you either ordered fish or pasta and the waiter would give you the options. 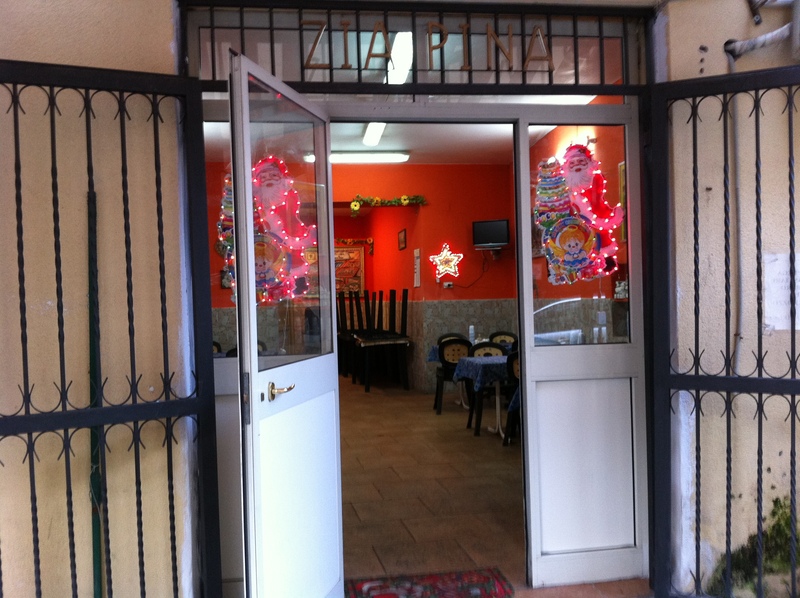 It sounded like the perfect place to eat authentic Sicilian food while truthfully experiencing the mafia culture. We spent ten minutes wandering the market area in which we had been an hour before trying to find the place, but the map that my iPhone provided was failing us. Before giving up I asked one of the local fish mongeI rers who told me exactly where to find the place, through a section of dilapidated houses that were some of the most run down that I have ever seen. It would have been off-putting and if we had been forced to go far through a neighborhood like that I would have felt a bit uneasy, but we soon saw Zia Pina and entered. Since we obviously had no clue what we were doing and were obviously not Sicilian there were a few nasty glances thrown our way, but then I spoke Italian and everything was better. Our nice, but blunt, waiter asked “pasta o pesce (fish)”. It was lunch, so pasta. 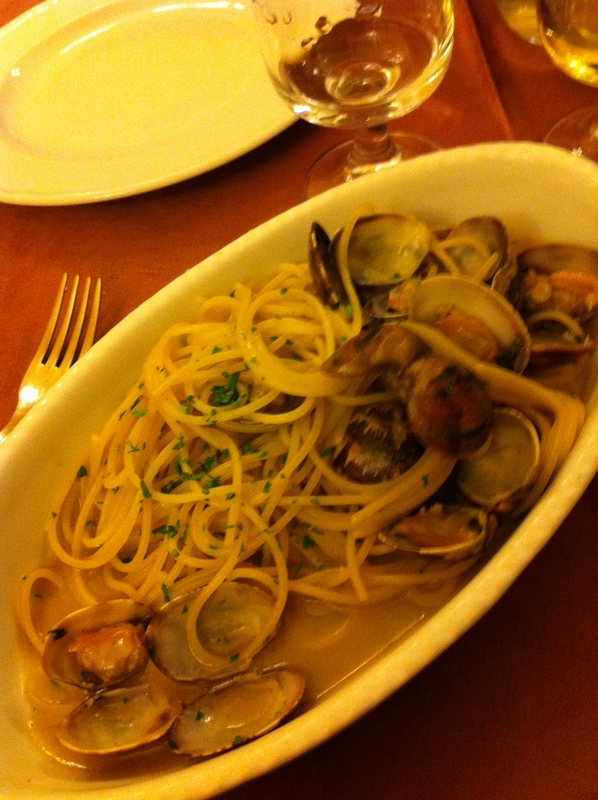 “Vongole o misto (clams or mixed). I got clams and ordered mixed for Brian. He took us to our table with a loaf (an entire loaf!) of Italian bread with sesame seeds and I ordered white wine. There were two parts to the restaurant. On the left was the kitchen with a long table of ice filled with the freshest of fresh fishes (at which I would get a better look later in the meal) and on the right was the seating area; spacious with few tables, no real doors, no amenities on the plastic tables with plastic cups and a TV. Were we in someone’s home or at a family picnic? It certainly didn’t feel like a restaurant, but from the beginning both of us knew we were in for a wild ride. More people sat down around us and I listened to how they, who seemed to know the place, ordered and how they figured out what to eat. They flat out told the waiter what they wanted and he would respond with what the kitchen had that day. They ordered a salad, so I ordered a salad, which that day was made of potatoes, tomatoes, anchovies, onions, green olives all cold in olive oil and white vinegar. The wine came out first and our hungry/thirsty/vacationing selves dug right into the bread (which was unbelievable) and the wine. We began to proclaim the glories of study abroad. We toasted to walking through questionable neighborhoods for great meals, for the New York Times, for having a friend willing to experience the world and most of all for having the fortune of spending a semester literally doing nothing of value to our “careers” [and it that sense I mean nothing to advance ourselves scholastically]. Before we could really launch into our chat, the pasta arrived. Beyond simple, the bowl had spaghetti and clams without the shells, while Brian’s had mixed white fish and shellfish. I smelled the sea and that special aroma of freshly cooked clams. I mixed up the past and twirled myself a bite; unbelievable. The taste was so clean. There was nothing but clams and unbelievably good pasta. I said nothing but “Oh my God, you have to try this,” without even looking up to see that Brian was having a similar reaction. We traded, took bites, had the same ‘heaven’ moments and traded back. These dishes were homey, they were motherly and they were comforting. Nothing fancy, nothing doctored up, no hidden tastes or masked spices. This was pasta and fish, basta. Perfetto. The salad followed soon after and I was surprised by how incredible cold potatoes could be when paired with tomatoes (by the way Sicilian tomatoes put all other tomatoes to shame), red onion, olives and anchovy. That dish, covered with oregano complemented our warm pastas perfectly. We took our time finishing and once again began the conversation. And we launched into memories of the semester, of all of the amazing sites we had seen, of all the experiences and all of the places we had been. When else in our lives would we be able to enjoy something like this? Was this the four greatest months of our lives? Our lives had been “jokes”, they had been ridiculous when one thinks about it. Dear James, what did you do abroad? “Well look at me, can’t you tell that all I did was eat?” This experience was not school, it was not an ‘education’ as one would think, but a cultural explosion. We traveled, we ate, we went to museums, we went to the opera, we met people, we went to countries where nobody could understand us and we couldn’t understand them let alone even read a street sign! We had taken thousands upon thousands of pictures and traveled thousands upon thousands of miles with no care in the world except to see the next thing. How goddamn, f’ing, incredible is that? We were still hungry and I saw the waiter walk by with some sort of grilled fish that looked delicious, but I couldn’t exactly make out the plate because he was holding it far over my seated vantage point. I didn’t care, I hailed the waiter, asked what it was and found out ‘calamari’. I ordered one, expecting that Brian and I could split it, but the waiter advised us to get two; we ordered two. The calamari arrived soon after in its beautiful grilled glory. The flesh was red and Brian had one of the biggest squid that I have ever seen. 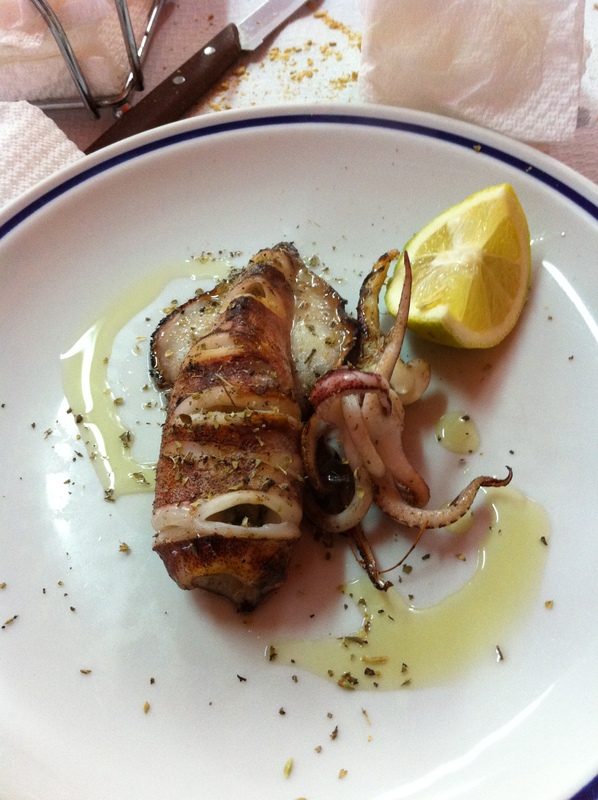 It was served whole with a wedge of lemon, but really who needs anything else when eating fresh, grilled calamari? Unbelievable. I’ve never tasted calamari quite as fresh and intensely as that with the wonderful complement of burnt grill flavor. The food was finished and the wine was finished, but we didn’t want to leave. I saw a plate of fried little fish on the table next to us. 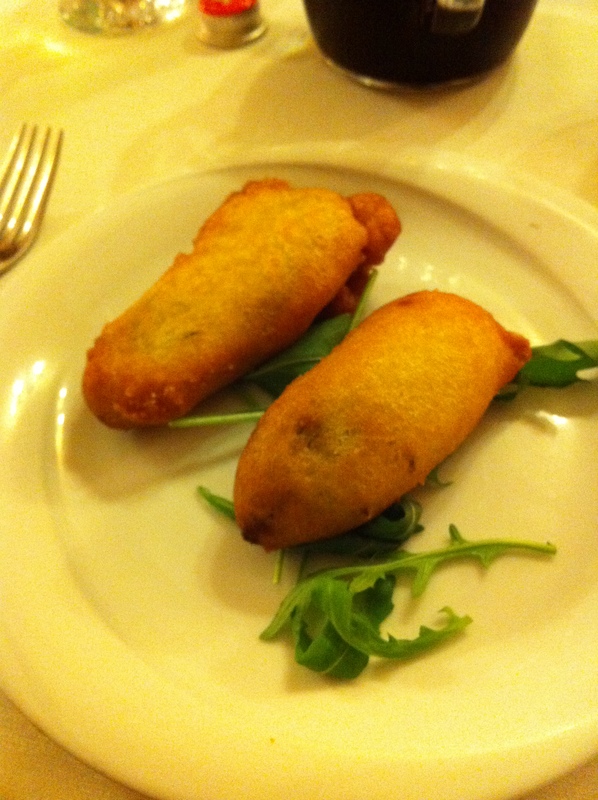 They looked like anchovies, so I ordered “alici fritti”, but the waiter told me they didn’t have any alici that day. He brought me to the kitchen and showed me that which they did have. There were some yummy looking little fish. I ordered those and more wine. The question of departure once again became the topic of conversation. We each explained our separate roller coasters of emotion and how both of us had been more than ready to go home after returning from London. We looked back at not enjoying Parma, of not enjoying abroad and of counting down the days until going home. We tried to figure out why and discussed the various reasons that come with the territory of studying abroad such as group dynamics and absence during holidays, but in the end both agreed that regardless of the reason for our dissatisfaction both of us had realized in early December that we did not want to leave at all, a date that was all too late because it left us only two weeks to enjoy Parma once more. And enjoy it we did, but the time flied and there we were; in some restaurant in Palermo, eating one of the most memorable meals of our lives and looking back at the last 4 months as if they had happened yesterday. Every memory was so vivid and every story so detailed. “Never have I had so many vivid memories of life from one semester,” Brian commented. And it is true. Our lives abroad were ever changing and ever moving. We were constantly doing and constantly experiencing, which could explain some of the desire to finish; we were tired. 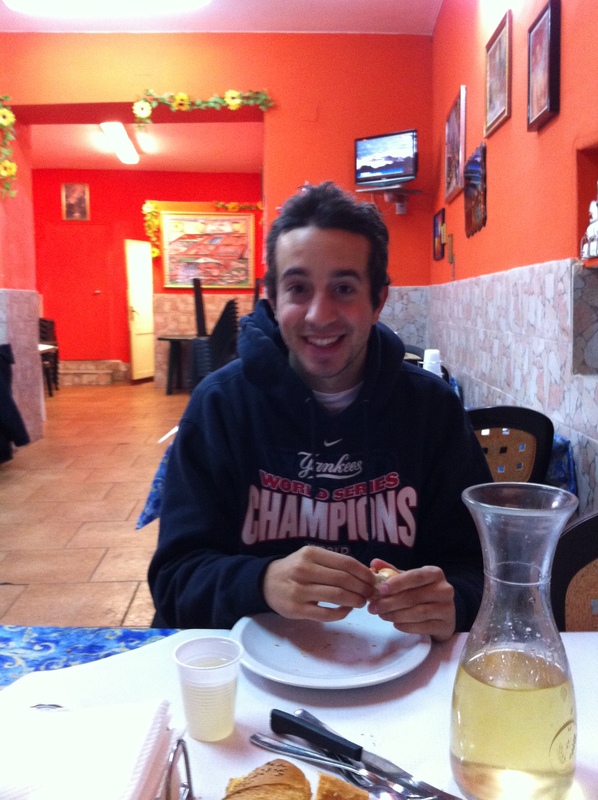 But sitting there in Palermo, neither of us wanted this to ever come to an end. Why would we? We wanted Parma to continue. We wanted aperitivo never to go away and weeknights spent sitting around a table having a drink to never disappear. 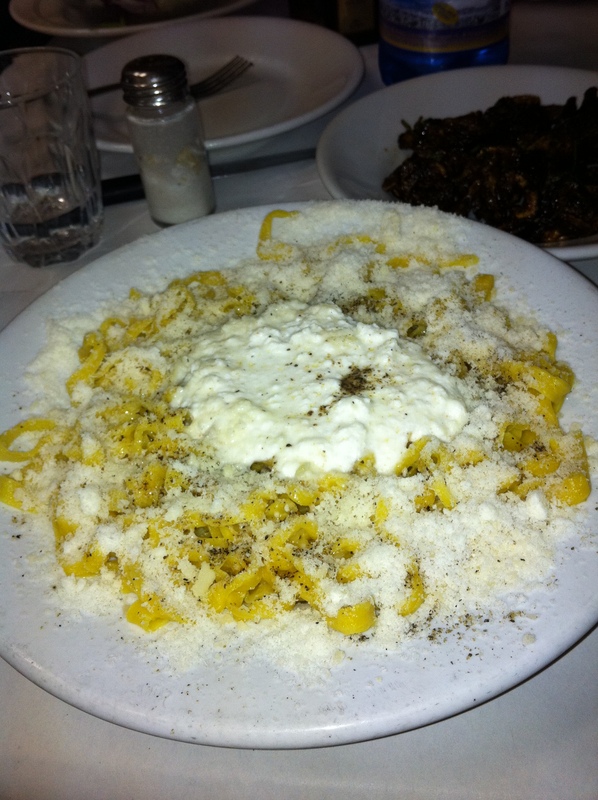 The culture of Italy, with its magnificent food, had settled within us and once it had, it was time to go. Thanks Time. Thanks. We couldn’t believe it. We didn’t want to believe it. It was ok. We still had two days before the end (and I had a few more). We would see Parma once more. But the memories would not stop and we spent the rest of the meal, munching on those fantastic fried fish and drinking too much wine (we were on vacation), expressing amazement at the fantasies which were our lives from September 7th to December 21st. After lunch, and some clementines, we wanted to do nothing but relax at the hostel, which we did until 5, when we figured we would explore what was happening in the neighborhood. We found some hole in the wall bar near the market where a bunch of locals, especially fishermen, were pounding down glasses of wine poured either from jugs, taken out of water coolers or poured from sketchy bottles. Seemed fine to us. We got some water jug marsala (for a euro), which was terrible and then a cup of white (we were served in plastic cups while everyone else received glass). Then a government worker came in and began to check the receipts of this fine establishment. 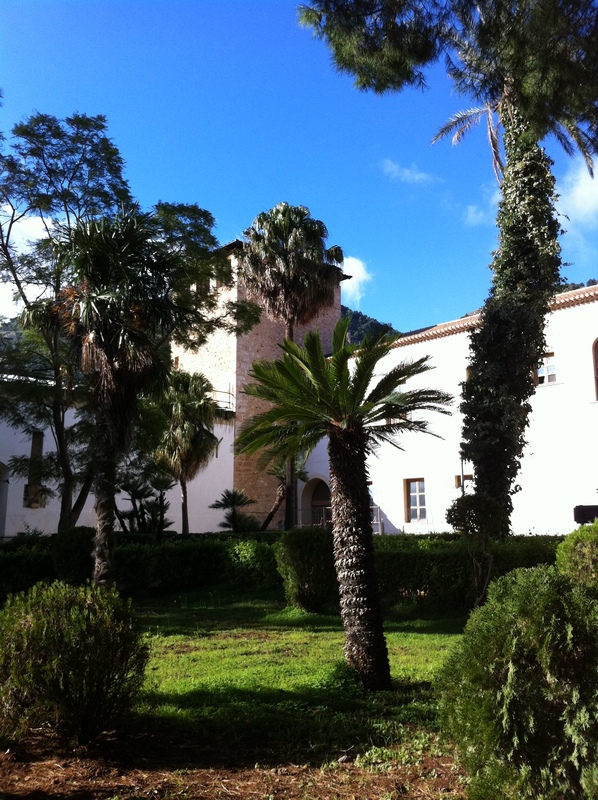 Apparently, the place had not been recording profits, as is the normal in the south of Italy. Another bar tender came to tend the bar while the main guy dealt with the government official, and he started washing dirty glasses with his hand in water without soap. Good thing we got plastic cups. We left and, after another reprise at the hostel, spent the rest of the day wandering around the city including to the docks where we quickly decided that we should not have gone.